For many people in New England, Sundays in the fall are spent in front of the television watching football and rooting for the Patriots. This year, in Biddeford and Saco, an increasing number of people spent that time outdoors taking advantage of the nice weather and the new sections of the Eastern Trail. In the past two months, a new 6.6 mile multi-use trail has been opened from Biddeford to Kennebunk and construction on an additional 5 mile section is nearly finished in Saco. Both sections are part of a 3,000 mile route that the Eastern Trail Alliance and East Coast Greenway is building from Calais, Maine to Key West, Fla. The two non-profit organizations have been working toward their goal for 20 years and the Biddeford and Saco sections are the latest to be added. Each of the new local trails has a bridge that spans a major road or highway. The Biddeford section starts behind Southern Maine Medical Center and crosses the Maine Turnpike. The Saco section, traveling a northerly route, crosses Route 1. “It’s incredible,” said Hope Hall, a Cumberland resident and Thornton Academy teacher, as she ran along the trail. Both trails have been busy since before they officially opened with walkers, runners and cyclists – even the people who are responsible for building the trails have been using them. “We’re just waiting for the final sign off on the Saco section,” said Scott Marcoux, and administrative assistant with the Eastern Trail Alliance. “But I’ve been down there myself to see how they are being used,” he said. Marcoux hopes the city will sign off on the trail in Jan. and then his group will set a date in spring to have a grand opening ceremony. In the meantime, many people are already using the new Saco trails. The city of Biddeford has signed off on its new section and a ribbon cutting ceremony was held in early November that marked the official opening. The Community Bicycle Center in Biddeford has used the nearby trails as a way to teach proper riding techniques and responsible citizenship to the children it works with. “It’s really been great to have a pristine place where kids can feel safe,” said Bronwyn Potthoff, a director at Community Bicycle Center. She went on to say that for the first time, some of the children are now getting together, on their own, to ride the trails. The section in Biddeford starts from behind the hospital and winds its way through the woods in a somewhat parallel fashion to the turnpike. The trail passes through wooded sections of Arundel in a southerly direction and the trees that line both sides create a quiet escape from the local roads. The trail doesn’t end in Kennebunk, but after passing over the turnpike, it connects with the section of the Eastern Trail that already existed in the southern part of the state. Like the Biddeford section, the new trail in Saco quietly passes through the woods. Parking can be found next to the Thornton Academy Middle School and the trail starts behind the athletic fields. The route passes in a northerly direction under the turnpike overpass and then winds around the Sweetser School. It too ends with a bridge – this one traveling over Route 1. 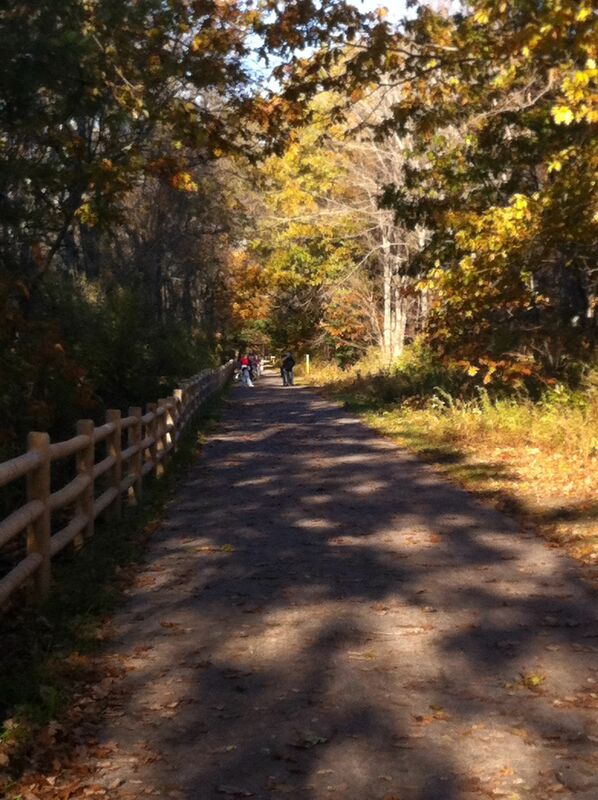 On the other side of the bridge, the trail connects with the existing Eastern Trail and from that point, cyclists, walkers and runners can journey all the way to the Scarborough Marsh. After leaving the marsh, the trail crosses Black Point Road and connects to the Greenway in South Portland. Phil Gendron, a member of the Saco River Cycling Club, and Buxton resident, has already taken advantage of the trails and ridden the entire route from Saco to South Portland. On Dec. 8, Potthoff and other members of the Community Bicycle Center attended an Eastern Trail Alliance board meeting. She said the focus has now shifted from raising money and building the trails to maintenance and outreach. “We would love to sponsor and maintain a section of the trail,” she said. Potthoff said that each municipality is ultimately responsible for maintaining the portion of the trail in its city or town, but the Community Bicycle Center would love to help. The details of who will maintain the new trails and how often that will happen have yet to be made public. “But there are plenty of people willing to help,” said Andy Grief, Community Bicycle Center executive director.